Synopsis: Austrian economists regard utilities as exceptional cases where regulation may be justified. The long term aim for a public utility should be to '...turn as much as possible of that industry into a private, competitive and unregulated industry'. In the short term this may mean a 'considerable role for regulation'. Price cap (RPI-X) regulation gives better efficiency incentives to companies than traditional US regulation and passes benefits on to consumers. 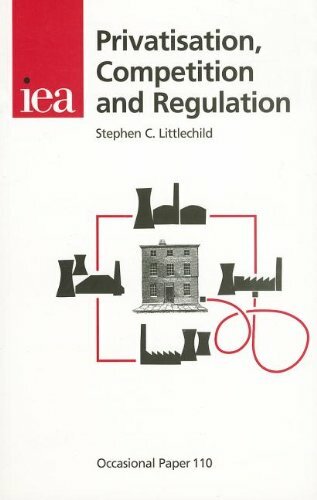 UK style privatisation and regulation put competition at the forefront whereas '...traditional US regulation for the most part suppressed it.' In electricity, competition in generation has stimulated efficiency improvements but it is still not fully effective. Big generators still set wholesale prices most of the time and the government's 'stricter consents' policy for gas-fired plant hinders entry to generation: that policy is the 'most significant obstacle to a more competitive market'. Competition to supply industrial consumers has resulted in large numbers of companies switching to new suppliers and prices have fallen considerably. Introducing competition to supply domestic consumers was a major logistical exercise.The cost was more than justified by the lower prices and other benefits now flowing from competition. Some of the changes to utility regulation now proposed by the government will not be helpful - such as the qualification to the regulators' duty to promote competition. The next step should be a further transfer, from government to consumers, of control over the utilities. A challenge is to find ways by which competition can substitute for regulation in remaining monopoly sectors. 8. Economic fallacies exposed. Occasional paper 102. 2. impr.